So Flickr has finally announced a deadline for their login-migration to the Yahoo!-ID system: 31st of March. While this announcement has definitely caused quite a lot of rumble in the Flickr community I fail to see why. First of all, the moment they got acquired by Yahoo! it was clear that something like this would happen (not could). Now I did this account-linking procedure today and was actually quite surprised to notice, that you can still use your old email address for all the account related stuff (like getting news etc.). So now that I don’t have to use yet another email address/account I’m actually not seeing anything negative about the move to the Yahoo! login since I don’t exactly hate Yahoo! (at least not that much more than Google ;-) ). 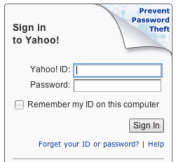 On the other hand, it would have been nice if there would be some apparent benefits for the user to merge their Yahoo! and Flickr accounts. Without this it all just looks like a cheap way of making it easier for Yahoo! to collect demographics. There is also the problem that I wouldn’t know where to move my photos to if Flickr really starts to annoy the hell out of me. Over the last couple of years I’ve looked at some of the alternatives like Zooomr and 23hq, but I never felt at home there as I do with Flickr. So I guess it will take quite a lot to get me away from the Web2.0 pioneer. On the other hand if Yahoo! gets the idea of forcing their login system also on their social bookmarking service del.icio.us, I see some really viable alternatives for me … or to be precise: Even a concrete one. Ma.gnolia. Simply because Ma.gnolia also has some features that del.icio.us is lacking but that I’m actually interested in (like true groups etc.). I haven’t seen any really compelling new features on the Flickr alternatives out there that would make me move for now. In the end I guess Yahoo! will have to do quite a lot to Flickr to really annoy me enough to drive me off. But apart from the login system I actually haven’t noticed anything negative since the takeover.